It’s not a very good photo of a framed painting behind glass, but this is one of my larger watercolors from some years ago. (Maybe I can get a better and bigger shot to share later.) 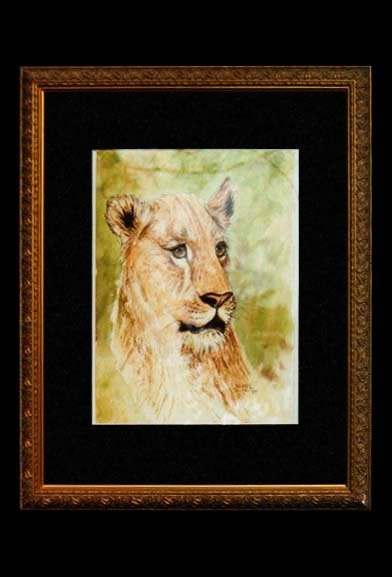 I used to do a good deal of portraiture, wildlife and scenic paintings in watercolor, one of my top favorite art mediums. I also used to do many ink and wash paintings and ink sketches. I am a big fan of black and white (and shades of gray in-between, which includes pencil sketches), though I have been exploring loads of pure color in recent years. After pencil, charcoal and ink, I began in oil paints, then moved into watercolor as well as acrylic, which I play with most these days. The great thing about sketching and painting, is that you can go all over the place, trying many styles and mediums.